Come and see Pheronym pitch at IndieBio Demo Day on Sept 14 between 3 and 5 PM Pacific time. Join us to bring 21st century crop protection to the world. We, Fatma and Cameron, are delighted to tell the story of Pheronym at Popping the Bubbl with Sandra and Pete. To listen the podcast interview, click on the link. Pheronym was selected to be in the California Life Sciences Institute Fall 2017 Fellows All-Stars Team (FAST) advisory program.  Pheronym was one of the eight science startup companies. We are very excited for the opportunity to work with FAST advisers. 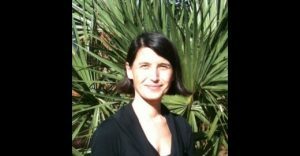 Abigail Perret-Gentil is presenting at the APS meeting in San Antonio, Texas, August 5 – 9, 2017. 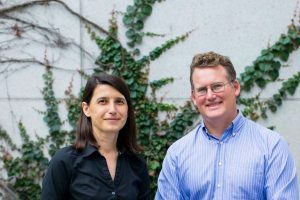 Pheronym was awarded a USDA-SBIR phase I grant titled “Leveraging Nematode Signals to Enhance Entomopathogenic Nematode Efficacy for Pest Control“. The SBIR partners include Dr. Fatma Kaplan at Pheronym (PD), Dr. David Shapiro-Ilan (Co-PD) at the USDA-ARS, Byron, GA and Dr. Ed Lewis (Co-PD) at the University of Idaho, Moscow, ID. The proposed project will test the feasibility of using nematode released factors to improve entomopathogenic nematodes’ (EPNs) efficacy (ability to kill) in biological control. Broad-spectrum synthetic pesticides have adverse effects on the environment and human health. For example, approximately 26 million human poisonings and 220,000 deaths occur annually due to synthetic pesticides worldwide. We need environmentally friendly non-toxic agricultural pest control. One of the solutions is to use environmentally friendly biopesticides such as EPNs. EPNs, natural enemies of insects, are used as biological control agents for many economically important insect pests such as the black vine weevil, Japanese beetle, Diaprepes root weevil, and fungus gnats. Furthermore, they are so safe to the environment and humans that EPNs are not regulated as pesticides in the US. One of the major problems with EPNs is their variable efficacy in the field. This is a major hindrance to EPNs’ wider adoption for insect pest control. One of the reasons for this variability is that EPNs clump together and do not disperse sufficiently in commercial aqueous applications. 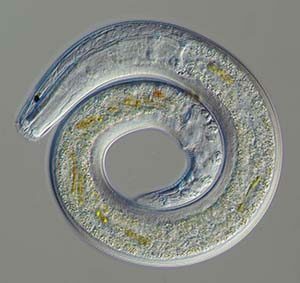 Recently, our group found that nematode released factors can disperse EPNs under laboratory conditions. 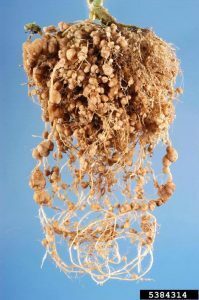 The overall goal of this project is to demonstrate the feasibility of nematode factors to improve dispersal leading to the improved EPN efficacy. We will test the effects of adding nematode factors in laboratory and greenhouse assays with three different types of soil, and optimize exposure time to the nematode factors for consistent dispersal and infectivity. The anticipated results and potential commercial applications of the proposed research: This proposed research will improve EPN efficacy as biological control agents, encourage wider EPN adoption, provide alternative pest control to the agricultural industry and farmers (organic and conventional) and reduce toxic chemicals in the environment. Once proven successful for two important model EPN species, we will expand this technology to other commercial EPN species with different and specialized insect hosts to improve their field efficacy. The potential for commercial application is enormous. Pheronym was featured in the July/August 2017 issue of OurTown Magazine as one of the Florida Innovation HUB tenants. 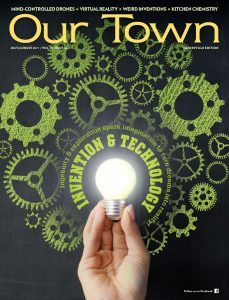 Here is a link to OurTown Magazine. threaten our food security by reducing plant yield or cause diseases in animals. Read more: the link to My Vision of the Nematode Pheromone Field in the next 5 years. Pheronym was featured by Gainesville’s WCJB TV20! Our very own Abigail Perret-Gentil was interviewed by WCJB TV20 for What’s Growing On? Nematodes. She talked about plant parasitic nematodes, beneficial nematodes and how we at Pheronym leverage pheromones to control them both for crop protection. Pheromones offer one of the most powerful solutions for environmentally and ecologically friendly pest control. Yet, their use has been limited to baiting traps and disrupting mating for the past 60 years. At Pheronym, we believe pheromones can do much more. 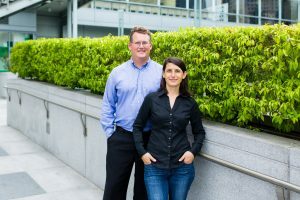 Pheronym is unlocking the potential of pheromones and revolutionizing their use in the global pest control market. Read more about New Wave Pheromones on Medium.